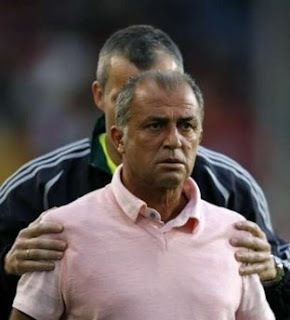 After Emre's huge announcement by Fenerbahce club on Friday, there are rumors that Fatih Terim Turkish National coach might sign with Fenerbahce after the Euro 2008 Tournament. According to the reports from Turkey, Fenerbahce also gave a proposal to Fatih Terim, the technical director of Turkish national team. It is claimed that Fenerbahçe also made an offer to transfer the technical director Fatih Terim and has achieved an agreement of 80%. Fenerbahce reached an agreement with Newcastle United in order to sign the Turkish player Emre Belozoglu .Fenerbahce team has to work out the details of the contract with Emre and His agent. Turkey's national soccer team pose prior to a friendly between Turkey and Finland in Duisburg, western Germany, Thursday, May 29, 2008, in preparation for the Euro 2008 soccer championships. Down from left: Hamit Altintop, Sabri Sarioglu, Nihat Kahveci, Tuncay Sanli, Mevlut Erdinc, Emre Beloezoglu. Up from Left: Mehmet Aurelio, Gokhan Zan, Servet Cetin, Hakan Balta, Volkan Demirel. Turkey put in their most impressive performance of their warm-up matches for Euro 2008 here on Thursday as they eased to a 2-0 win over Finland. Goals by Middlesbrough's Tuncay Sanli and Semih Senturk, leading scorer in the Turkish championship last season, gave Turkey a deserved win and will have done them no harm of good ahead of their opening Euro 2008 Group A match against 2004 finalists Portugal. While Tuncay and Semih got the goals it was the young Turk Mevlut Erdinc that caused interminable problems for the Finnish defence, as the striker, who plays for French First Division side Sochaux, twisted and turned them everywhere. Equally encouraging for fiery coach Fatih Terim was that his defence re-enforced by Servet Cetin and Mehmet Aurelio showed much more resolve than in their previous two matches which saw them beat Slovakia 1-0 and then lose 3-2 to Uruguay. Tuncay opened the scoring in the 15th minute, after good work by Sabri Sarioglu and Semih added a second two minutes from time after seizing on a ball from Kazim. Punters are now within touching distance of three weeks of top Euro 2008 soccer betting action. The coaches of the 16 teams qualified for the 2008 UEFA European Championships have named their final squads for the event starting June 7th, and leading online sportsbook, PinnacleSports.com, have for some time posted outright prices and odds for the winners of each Group. PinnacleSports.com are also offering a host of other Euro 2008 bets including Asian Handicap betting and total goals markets for the opening fixtures, priced to just 102% - which gives punters 60% better Euro 2008 betting odds than traditional bookmakers. Portugal lead the Group A winner’s betting market at PinnacleSports.com priced 2.350* to top the pool phase. The Portuguese possess an enviable pair of wing wizards in Manchester United’s Cristiano Ronaldo and Luis Nani, but cannot match that quality in the striker department. Though the Portuguese lost just once during Group A qualification, they finished second, having drawn six of their 14 games. Ronaldo was their top-scorer with eight goals, but an unhealthy amount of expectation rests on his young shoulders, and if the opposition can neutralize his threat, coach, Felipe Scolari may struggle with a plan B. As hosts in 2004, Portugal progressed to the final, and despite being strong favourites, lost out to a single Greek goal. The Portuguese may however, have been flattered in reaching the final, as England had a perfectly good goal ruled out against them in the semi-final. They were also left sweating on qualification for Euro 2008 right up to the final game and key playmaker Deco has had a poor season with Barcelona. Nevertheless PinnacleSports.com make Portugal one of the favourites on their Euro 2008 betting market at 8.600*. After topping Group D at the finals of Euro 2004, with three wins, including over Germany and Holland, the Czech Republic became many punters’ favourites to go all the way. In the event they were beaten by a dogged Greek side in an extra time semi-final. Much of their success was the product of the creativity of Tomas Rosicky and Pavel Nedved, and goals of Milan Baros. However, Rosicky is out of the Euro 2008 through injury, Nedved is retired while Baros has struggled to emulate the form he showed in Portugal. 35year old striker Jan Koller is one of several Czech players reaching their sell-by date, so coach, Karel Bruckner, has tried to mix youth with experience. Euro 2008 will be the Czech Republic’s fourth straight European Championship stretching back to Euro 1996 in England when they were surprise finalists, losing to Germany. They qualified this time round ahead of tournament favourites Germany who they beat 3-0 in Munich, but are nevertheless considered unlikely winners priced 20.00* on PinnacleSports.com’s Euro 2008 betting market, but just 3.330* to top Group A.
Turkey’s third place finish at the 2002 World Cup was an immense achievement that catapulted those players involved to national heroes. Unfortunately, the story since then has failed to match that magic, with failed qualification to the 2006 World Cup marred by violent scenes against Switzerland that ended with several lengthy bans, which will make the rematch potentially fiery. Though some of that volatility remains, coach, Fatih Terim has been able to guide the national side through a tricky qualifying group to the finals in Austria and Switzerland. A 2-1 victory in Norway was the pivotal result in their penultimate qualifier and if Turkey can show the same resolution at the Euro 2008 finals, they could easily negotiate a path out of an open group. Injury problems have abated leaving Turkey without any major obstacles in preparation. Emre hasn’t had a great season at Newcastle, but the left-footed midfielder is capable of match-winning skill, playing alongside Hamit Altintop who has enjoyed a steady season at Bayern Munich while Tuncay Sanli has steadily improved at Middlesbrough. Volatility is the Turk’s main weakness, part of the reason why PinnacleSports.com price them 58.00* in their outright Euro 2008 betting markets, with odds of 8.440* to top Group A. Of the two hosts of Euro 2008, the Swiss are certainly considered the likelier to make a real impact on the event. Their chances have however, been dealt a severe blow by a spate of injuries that has ruled out several key players and placed doubts of many more. Tranquillo Barnetta, Christoph Spycher and Philipp Degan all missed the 2-0 friendly win over Slovakia on May 24th, though hopes are high that they will participate in the tournament. On the plus side, striker, Alexander Frei has returned to form after long-term injury, and much is expected over 19 year old Eren Derdiyok. The 6ft 2” striker, scored within minutes of a substitute appearance at Wembley against England, only his second appearance for the Swiss national side. In common with Austria, Switzerland have lacked competitive football, qualifying as hosts, but their showing at the 2006 World Cup, where they didn’t conceded in open play in four games, shows they are defensively tough, if lacking creativity. PinnacleSports.com price Switzerland 33.00* outsiders on their Euro 2008 betting market, with odds of 4.780* to win Group A. The Turkish national team will play its last warm-up match against Finland in Germany today before heading to Switzerland to prepare for next month’s UEFA Euro 2008 proper. Fatih Terim’s side has played two friendlies so far, winning one and losing one. Fatih Terim boys beat Slovakia 1-0 in their first match and lost 3-2 to Uruguay on Sunday despite going ahead twice. Even though the Uruguayans were awarded two penalties, the general consensus was that Turkey lost as a result of poor defending. And the reason is not far-fetched. Servet Çetin, one of Turkey’s best defender, is injured and have not been fielded in any of the friendly matches. HALIL ALTINTOP, YILDIRAY BASTURK AND IBRAHIM KAS ARE THE LAST PLAYERS CUT BY FATIH TERIM!.. Turkey coach Fatih Terim has announced Turkey's final 23-man squad for EURO 2008 finals with a press conference he held at Hotel Klosterpforte in the German village of Marienfeld. Terim decided to exclude Germany-based Turkish duo Yıldıray Baştürk and Halil Altıntop along with Beşiktaş defender İbrahim Kaş. Turkey slid to a 3-2 defeat to Uruguay in Bochum Sunday in a friendly international ahead of next month's European Championships. Turkey welcomed back midfielder Hamit Altintop, who has recovered from a foot fracture, and the Bayern midfielder set up the first goal in the 13th minute with a cross which Arda Turan headed home. Luis Suarez equalized for the South Americans in the 31st minute before Nihat Kahveci put Turkey back in front six minutes after half-time. However Suarez notched his second with a penalty in the 78th minute and Cristian Rodriguez converted another spot kick five minutes from time. Turkey, who are in Germany training for the June 7-29 tournament in Austria and Switzerland, on Tuesday defeated Slovakia 1-0 in Bielefeld. A third and last test match follows on Thursday against Finland in Duisburg. Turkey defender Gokhan Gonul has meanwhile been ruled out of Euro 2008 because of a foot injury. Turkey coach Fatih Terim called 27 players into the training camp and will trim it to 23 by Wednesday's deadline for squad nominations. Turkey are in Group A with Portugal, the Czech Republic and Switzerland. Turkey: Volkan, Hakan Balta, Gökhan (Mevlüt 87), Emre Belözoğlu (Halil 65), Mehmet Topal, Nihat, Yıldıray (Tuncay 65), Arda (Tümer 60), Emre Aşık, Hamit (Sabri 46), Kazım (Ayhan 46). Uruguay: Carini, Alcoba, Godín, Gargano, Caceres, Eguren, Suárez, Cavani, (Fernández 46), Pereira (Silva 68), Giménez (Rodríguez 56), González (Flores 75). The Turkish national team plays Uruguay in Bochum today in its second warm-up match for next month’s Euro 2008 championship. And than, Four day later, Fatih Terim's boys will take on Finland in Duisburg in four days before leaving Germany for Switzerland on June 1. Turkey coach Fatih Terim announced the decision together with national team doctors Bülent Bayraktar and Cengiz Dinç. "Scans have showed that Gökhan should be rested for at least four weeks without participating in any training sessions. We did our best to keep him in our squad but our players' health is more important in any case. Therefore, we were forced to remove him from our EURO 2008 squad. This decision will surely disappoint him. He will return to Istanbul and continue his treatment there" Terim said. The experienced coach also added he were not intending to call a replacement for Gökhan. Hamit Altıntop: "I'm ready to play"
FC Bayern München midfielder Hamit Altıntop made a short statement to the media, by saying: "I have totally recovered from the foot injury. I don't feel pains anymore and I'm ready to play at the moment. I can say that playing against Portugal in the first match in the group is an advantage. for us. If we play good enough, we can win this game. If we can apply Fatih Terim's tactics on the pitch, then there will be no problems. We will do our utmost in order to be successful." Turkey and Portugal will be the first teams to arrive at their base camps for next month’s UEFA Euro 2008. Group A rivals Turkey and Portugal will arrive at their bases in Neuchatel and Geneva, respectively, on June 1. Teams preparing for the finals in Austria, Poland (Bad Waltersdorf) and Italy (Baden bei Wien) will arrive on June 2. Under UEFA Euro 2008 regulations, every team must arrive at its team base camp at least five days before its first match. Spain will be the last of the 16 nations to arrive at its Tyrol headquarters on June 5. The referees will check into their hotel in Regensdorf near Zurich on June 2. Most training sessions will be held behind closed doors, but 14 of the 16 teams may abide by the UEFA's recommendation to open at least one training session to the public. Fatih Terim, Turkish National Team head coach,hired British Sports Agent, for him self before the Euro2008 tournament. Power Goldberg Sports Management, website introduced Fatih Terim as their new client on their website. Power Goldberg Sports Management represent famous sports figures in the world. Fabio Capello, who was hired by England Football Federation recently to coach the National team,also is client of Power Goldberg Sports Management agency. One of the partners of Powers Gold Sport Management,Mel Goldberg has assisted Fabio and recommended him to the FA for the England managers position. "I think it will be hard for me to stay. Talks so far have not been the best. There are questions about my technical staff and I am a bit sad that the entire situation came up 15 days before the end of my contract. After two seasons there I thought they would have given me a bit more time." Fenerbahce soccer team's coach Zico is heading for a new job with the Portuguese team Benfica. Portuguese newspaper Record reported that the Portuguese club is now interetsted to enlist Zico after Michael Laudrup did not respo9bnd to an offer by Benfica on time. Record said Zico would have a good impact on Benfica's players as he was known as a "soccer god". It said the Brazilian coach asked to be given until Monday to respond. Turkey U-23 Men Open Toulon International Tournament With 3-2 Win To U.S.
Turkish National Under-23 Men’s National Team won a 3–2 decision this evening aginst U.S. National Under-23 team at the Toulon International Tournament taking place in Toulon, France. U.S.team after falling behind 2-0 at halftime, the U.S. cut the lead in half when Eric Brunner scored in the 58th minute, but it was short-lived as the U.S. let in a goal just thirty seconds later. Forward Sammy Ochoa pulled the U.S. within one goal in the 72nd minute with a spectacular strike, but Turkey held on for the victory. The U.S. will next face Ivory Coast on May 23 in their second match of Group B at the Toulon International Tournament. Early action for Turkey came in the seventh minute when U.S. goalkeeper Dominic Cervi boggled a bad bounce in front of the net, but Turkish forward Ilhan Parlak was unable to get a shot off. In the 14th minute, the U.S. received a golden opportunity when Ochoa capitalized on a poor back pass from a Turkish defender, but his first-time volley directly from 12 yards out in front of the net was wide right. Five minutes later, Turkey took the lead when forward Sam Orhan trapped a deflected corner and quickly sent it back into play for unmarked teammate Eren Gungor. Gungor placed the ball in the lower right side of the net catching Cervi off guard and on the other end of the goal line. Thirteen minutes into the second half, U.S. forward Eric Brunner received a corner kick from Kamani Hill and struck a solid volley into the back of the net to bring the score to 2–1. The one-goal difference didn’t hold up long though, as thirty seconds later Turkey retaliated with its third goal of the match. Erkin Caner served a long ball up the middle of the U.S. defense, finding Ilhan, who held off two U.S. defenders before putting the ball past Cervi. The U.S. continued their pressure and tallied again in the 72nd minute when a Turkey deflection provided Ochoa with a chance to rifle a shot past the Turkey goalkeeper from 18 yards out. As the minutes ran down on the clock, both teams were awarded goal opportunities. U.S. substitute Brek Shea chested the ball down and stroked the ball just left of the goal in the 82nd minute. Erkin took a direct shot in the 91st with a wide dive right from Cervi. TERIM, WAS TENSE IN THE FIRST HALF....AFTER THE WIN, HE SHOWED SIMILE!.. A goal by Hakan Balta in the second-half was enough to see the Turks to victory but their performance satisfied veteran coach Fatih Terim, who said he had not had six first choice players available to him including star forward Nihat Kahveci. Terim started with an experimental starting XI throwing in fresher faces such as Mevlut Erdinc, who plays for French side Sochaux, and it clearly showed in the first-half display in which they were not very well organised. Defensively they had their nervous moments and had to thank one of their heros from 2002 in goalkeeper Rustu Recber from saving them. After Terim sent in Emre Belozoglu and two other less raw talents in right wing Sabri Sarioglu and striker Gokdeniz Karadeniz the rhythm changed . They finally breached the Slovakian defence in the 63rd minute as Hakan shot home with a left foot shot. The Slovakians - who have not qualified for Euro 2008 - only looked dangerous in the latter stages after Filip Holosko came on for captain Robert Wattick and caused their rivals defence a few problems.Turkey's next warm-up match is against South American outfit Uruguay on Sunday in the German city of Bochum. Slovakia: Senecky, Kravcik, Skrtel, Hubocan, Zabavnik, Petras (min. 90 Novak), Hamsik, Sestak (min. 86 Kolbas), Mintal (min. 68 Jakubka), Cech (min. 68 Zopcak), Vittek (min. 78 Holosko). Again, this is not his team....This team belongs to whole Turkish people and Turkey. Turkish National team will have a light work out in the morning before a friendly match against Slovakia on Tuesday. Turkey's national soccer team coach Fatih Terim talks during an interview with the Associated Press in Istanbul, Turkey, Saturday, May 17, 2008. Turkey is in group A with Portugal, Switzerland and Czech Republic in the Euro2008, European Soccer Championship finals which will take place in Switzerland and Austria in June. Turkey coach Fatih Terim will pin his hopes of success at next month's European Championship on a pair of overseas-based strikers. The Turks, who have struggled a bit since reaching the 2002 World Cup semifinals, will likely have Nihat Kahveci and Tuncay Sanli up front when they face co-host Switzerland, Portugal and the Czech Republic in Group A. "They are already playing in Europe's top leagues, and they are playing good," Terim said. "I hope they will keep scoring for us as well." Kahveci, who has evolved from a promising right-winger into an established striker since his arrival in Spain in 2002, led Villarreal in scoring this season. The 29-year-old forward helped the team secure second place behind Spanish league champion Real Madrid. Sanli wasn't as prolific in the Premier League, going scoreless for a 12-game stretch, but he still managed to knock in eight goals in his first year at Middlesbrough. Behind the favoured pair will be Mevlut Erdinc of Sochaux, who scored 11 goals in the French league and made his international debut in a disappointing 2-2 friendly draw with Belarus in March. But Terim said his attacking force is not limited to his strikers. He likes it better when his players can move wherever they want on the field to create more chances. "You will see the team as a whole," Terim said. "You will see a team without too much distance between the columns of players. The 11 players will act as one piece." Another key player will be Mehmet Aurelio, the Brazil-born midfielder who has been a mainstay in Turkey's lineup ever since he became a citizen of his adopted country. Although Turkey failed to qualify for Euro 2004, the team reached the quarter-finals at the 2000 tournament in the Netherlands and Belgium, advancing behind Italy in its group but eventually losing to Portugal. The match against Switzerland, Turkey's second of the three in the first round of this year's competition, will likely bring up some bad memories. The Turks and Swiss played in a two-leg playoff for a spot in the 2006 World Cup. Switzerland won, but the final match ended in a brawl believed to have been instigated by an assistant coach for Turkey. The scuffle between the players in Istanbul prompted FIFA to order Turkey to play its following six matches at neutral venues with no fans. The world governing body of soccer later reduced the punishment to three games. Terim said what happened was unpleasant, but that it was history. "What happens in football, stays in football," Terim said. They did their first work out in Germany. The work out started with American conditioner Scott Piri, than under Fatih Terim's direction they hold a light work out in the Hotel's soccer field. On the other hand, Servet, Gokhan and Ugur Boral did not participate in the both practice session on a first day in Germany. Turkey will have a friendly match against Slovakia on Tuesday. TERIM:" I HAVE CALLED UP, BEST FORMED PLAYERS"
Fatih Terim is under a lot of pressure not calling Mehmet Topuz from Kayserispor and Hakan Sukur from Galatasaray. At the press conference in Antalya , Fatih Terim Said "Concerning the non-inclusion of Hakan Sukur and the assigned forward, he stated: "Semih, Nihat, Halil and Mevlüt are in better shape than everyone else. I chose them for this reason. There is no need to explain them one by one. Not just Nihat, Halil, Mevlut and Semih, I would even assign Yıldıray for that position. Semih is the best scorer in Turkey. Nihat is the best in Spain. Halil makes significant contributions to Schalke. Mevlut is a different choice for us." Terim stressed that Servet Çetin and Gökhan Gönül's injuries did not surprise him. "Since the group matches, we have been experiencing difficulties due to injuries. In some matches, all of our 11 players had injuries. Injuries Gönül and Cetin suffered here surprised us. I hope we see no more injuries during the preparations in Germany. I have no doubt that Servet will play in the championship," he noted. Terim defended his decision on the composition of the squad. "This is our decision. Everyone wants to play for the national team in a European championship. But I listed those players who I think deserve to go," he said. The coach of the Turkish national team also commented about his enthusiasm in attending a European championship after 12 years. "I always feel the same enthusiasm. I feel it in my bones. In 12 years, many players left the squad, but one thing remained the same. You will go there and be successful. You have to be successful. My enthusiasm and ambition are not at the highest level. If not for these, I would not be here," he said. Terim added that they decided to play against Slovakia, Uruguay and Sweden since their styles are closer to their rivals. Blackburn offer one more year to Tugay and more! According to a tiny snippet in the Daily Mail, Rovers have offered the 37-year-old midfielder a one year contract that includes..... a role coaching Rovers' youngsters. According to Dutch daily De Telegraaf,Arsenal soccer team is interested in recruiting Nuri Sahin, now on loan to Feyenoord by Borussia Dortmund. Nuri Sahin, a 19-year-old Turk, is owned by Borussia Dortmund, with whom he became the youngest ever Bundesliga player when he made his first-team debut back in August 2005. Since then, the German-born midfielder risen to fame winning international recognition with the national team of Turkey. At the moment he has a one-year rolling contract with BVB, with the German side having previously allegedly turned down a 3 million British pounds bid from Arsenal for the young star. Newspapers report the value of Sahin is up and it could take 10 million pounds for Arsenal to transfer him. Young Turks(U-17's) will face France at the Mardan Sport Complex in Tuesday's UEFA European Under-17 Championship semi-finals before holders Spain take on the Netherlands at the Antalya Atatürk Stadium. 2005 winners Turkey, who finished ahead of the Netherlands by holding Serbia 0-0 will return for a third game at the Mardan Sport Complex. This time they take on 2004champions France, Group B runners-up behind Spain on goal difference following a 2-0 win against Switzerland, with the game starting at 6.30pm(11:30 ET ) local time. That stadium will also stage Friday's final at 7.30pm (12:30,ET)local time. The southern Turkish city's main stadium is staging one match in these finals, kicking-off at 9pm local time (2:00 ET). Spain, first in Group B having beaten the Republic of Ireland 3-1 tonight, play a Netherlands side who ended second in Group A after defeating Scotland 2-0, and are the only survivors not to have won this trophy in the past though they did reach the 2005 final. Defender Emre Gungor from Galatasaray was added to Turkey's preliminary European Championship roster Monday,after Gokhan Gonul and Servet Cetin was discovered with injuries. 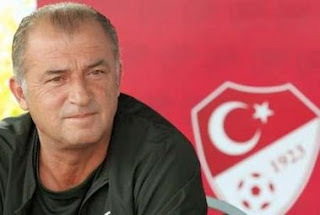 Gungor's inclusion brings to 27 players Turkey manager Fatih Terim has called into training camp along the Mediterranean coast in preparation for friendlies against Slovakia, Uruguay and Finland before the European finals set for June 7-29 in Austria and Switzerland. The squad will remain in camp in Antalya until Saturday, when it will leave for Germany for its final preparations. Terim must trim his squad to 23 before Turkey plays its group games in the Euro finals against Portugal, the Czech Republic and Switzerland. After the final match of the season, Galatasaray became the champions of Turkish Turkcell Super League with 79 points in 34 games, six points ahead of rivals Besiktas and Fenerbahce. 50th season of the top-flight soccer league in Turkey ended Saturday as Galatasaray and Fenerbahce qualify for next season’s Champions League, third-place Besiktas and Federation Cup winner Kayserispor qualify for the UEFA Cup. There was disappointment for Sivasspor, who came fourth by having same points with Besiktas but less goal average. The Istanbul-based club started season with German coach Karl-Heinz Feldkamp, who resigned at the start of April, citing differences with the management. Galatasaray were two points behind Fenerbahçe when Cevat Guler took over in a caretaker role. Also, the team hit by number of injuries, including two key foreign players of this season - Linderoth and Lincoln. However they accomplished five victories in last five games of season and clinched the 17th title for Galatasaray S.K. After the match, thousands of Galatasaray fans of all ages rallied at Istanbul’s central Taksim Square to celebrate with fireworks, flags and slogans, singing the club anthems. Similar celebrations took place in big cities like Ankara and Izmir in the huge outdoor parties, organized on the spot, letting them join their voice with millions of fans around the country celebrating the 17th title of the club. On the other hand, Vestel Manisaspor, Caykur Rizespor and Kasimpasaspor all failing to avoid the drop. Replacing them will be Kocaelispor and Antalyaspor who finished first and second respectively in the TFF 1. Lig, with the third spot still up for grabs from among the next four teams in the league who will contest the play-offs over the coming weeks. Turkey`s Galatasaray are the 20th most powerful soccer team in Europe, according to a ranking released on Friday. England`s Manchester United remained atop at the monthly "European Club Power Rankings" prepared by a Canada-based sports network --TNS. Galatasaray made its debut at the ranking. TNS said Galatasaray were closing in on their first Super League (first division) title since 2006 thanks to a huge victory over chief rival Fenerbahce last week to secure the 17th championship in the club`s history." IT IS PAST MIDNIGHT IN TURKEY AND FINALLY FATIH TERIM JUST MAD THE ANNOUNCEMENT ON THE TURKISH FOOTBALL FEDERATIONS WEBSITE. THE PLAYERS WILL MEET IN ANTALYA AND SPEND FIVE DAYS IN MINI-CAMP. Following their five-day camp in Antalya, Turkey squad will travel to Marienfeld, Germany where they will make their pre-EURO 2008 camp and play three friendly matches against Slovakia, Uruguay and Finland. Turkey advanced into the semi-finals after getting a point from their final group match against Serbia which ended goalless at WOW Football Centre. Hosts reached 7 points and topped the group one point clear of second-placed the Netherlands who beat Scotland 2-0. Following today's fixtures, Turkey were paired with France, while Spain will face the Netherlands in the semi-finals matches that are going to be played on May 13. Galatasaray won the Turkish title for the 17th time on Saturday with a 2-0 win against Genclerbirligi Oftas, wresting the championship back from their Istanbul rivals Fenerbahce. The victory in the final match of the season lifted Galatasaray to 79 points, six ahead of second-placed Fenerbahce, who lost 2-0 at Trabzonspor. Playing at their Ali Sami Yen stadium, Galatasaray took the lead in the 36th minute when Arda Turan sped down the right wing and crossed for veteran striker Hakan Sukur to score with a simple tap-in. Defender Hakan Balta made it 2-0 just before halftime with a powerful volley from outside the penalty area which flew into the top left-hand corner of the goal. According to TFF's website, Fatih Terim did not want to take away, the attention from very important matches that will happening on Saturday. As soon as The Saturday matches are over TFF will announce the list on their website. HAKAN SUKUR WILL NOT BE IN EURO 2008!.. According to the recent news article by Tayfun Bayindir from "Vatan" Turkish Daily newspaper, Turkish National Team coach Fatih Terim will not inculude Hakan Sukur in Euro2008 Turkey Roster. Later on Friday, Fatih Terim will anounce the 28 players that will train in Antalya starting on Sunday. Before leaving Turkey, Terim will drop the roster to 22 players after Antalya Camp. The Bahcesehir University in Istanbul, Turkey, officially launched the FIFA/CIES management programme on 6 May 2008. Prof. Jean-Louis Juvet, President of the CIES, who answered questions from media representatives about the programme and its objectives. "We are delighted for Turkey to be part of the FIFA/CIES university network, which will permit us to train and educate highly-qualified sports managers," said Prof. Dr. Deniz Ulke Arıbogan. The FIFA/CIES university network currently comprises eight members and will soon expand to other educational institutions in Central America, Asia and Oceania. The first course at the Bahcesehir University will begin in October 2008. Although a lot of people in the Turkish Media ,made Galatasaray, already Champions of the League, after the last weekend match against Sivasspor. Even, Galatasaray fans and some of the Galatasaray players acted like, they were Champions..
A tossup between Besiktas and this season's surprise package Sivasspor, both tied on third place with 70 points. Besiktas will be at home against Vestel Manisaspor the team allready relegated..
Sivasspor, looks like, will be the second team, will represent Turkey, in the UEFA Cup next season. All the matches will be played on this Saturday. "The Emperor" is back in charge, and with him ride Turkey's chances at the European Championship. Fatih Terim, who coached the Turks at Euro 1996 before leading Galatasaray to the UEFA Cup title in 2000, is the man most Turkish fans believe can lead the country to its first major success. "We are living everything in its extreme form: happiness and sadness, victories and losses," Terim said recently. "It's hard to carry this burden on our shoulders." Since retiring as a player, Terim has seen the best and worst as a coach. After Euro 1996, when Turkey finished last in its group with three straight losses, Terim led Galatasaray to Turkey's first European club title in the UEFA Cup. He followed that by moving to Fiorentina, where his success in Serie A led him to the top job at AC Milan. Terim lasted only nine games with Milan in 2001 before being replaced by Carlo Ancelotti. 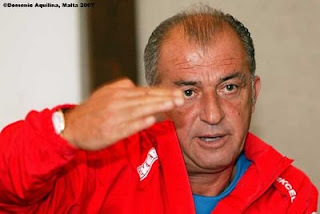 But Terim returned to Galatasaray for a couple of sub-par seasons before taking over the national team once again in 2005, giving the Turks what they had longed to see in his predecessor: charisma and authority. Unfortunately for Terim, the team he inherited was on the decline after having reached the semifinals at the 2002 World Cup. Turkey failed to qualify for Euro 2004, and then lost to Switzerland in a tense playoff for a spot in the 2006 World Cup. But Terim, who got the nickname "Imparator," or "Emperor" during his first spell at Galatasaray because of his authoritarian style, is hoping for more than just another first-round elimination when Turkey plays at this year's tournament in Austria and Switzerland. The Turkish fans expect Terim to salvage the national team, but the coach is cautious when it comes to making promises — especially in a group with contenders Portugal and the Czech Republic, and co-host Switzerland. 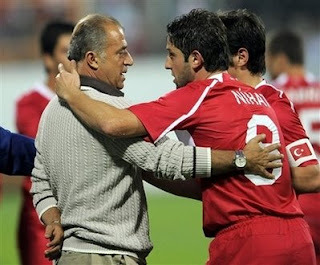 "I made a promise, we will get past the group stage and our achievement will be significant in the finals," Terim said. "We have to do something good in the finals and our faith is strong." Villarreal are on the verge of securing their highest ever Primera Liga finish after beating relegation-threatened Recreativo Huelva on Wednesday night. Nihat Kahveci's 18th goal of the season and a late Guille Franco strike proved enough to seal victory for the visitors in a tight contest. Manuel Pellegrini's side, who finished third in 2005, began the day four points clear of third-placed Barcelona and with just two rounds of the championship remaining. And the win over Recre has left them favourites to claim the runners-up spot behind champions Real Madrid. While Villarreal sought a victory to consolidate second place, Recreativo's need was far greater coming into this match. The Andalusian side began the day just above the relegation zone and could ill afford another defeat after Saturday's 3-0 loss at Atletico Madrid. The home side started brightly and Florent Sinama-Pongolle almost gave them the perfect start. The Frenchman received the ball with his back to goal, turned and unleashed a powerful angled drive, but saw his effort crash into the side netting after seven minutes. The former Liverpool striker came even closer to breaking the deadlock with 26 minutes on the clock, but was this time denied by the crossbar after beating Diego Godin and rifling a cracking shot past Diego Lopez from the edge of the area. Sinama-Pongolle was a man inspired and turned provider on the half-hour mark. The Frenchman this time beat two defenders and charged into the area before passing to the unmarked Marcos Ruben, but the on-loan Villarreal midfielder saw his close-range effort saved by Diego Lopez. Four minutes later, Gerard Lopez put Sinama-Pongolle through, but the striker miscontrolled the ball and the chance was lost. 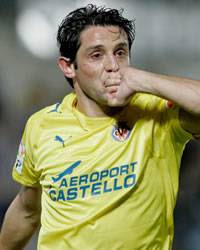 It was a rare mistake by the on-form forward and Villarreal were riding their luck at this stage. Recre continued to press as half-time approached and Marcos was presented with another good chance following Gonzalo Rodriguez's error, but was again denied by Diego Lopez. Everything changed after the break. Manuel Zambrano's side were unable to find the form they showed in the first period and suffered a hammer blow when Nihat smashed home a brilliant free-kick after 54 minutes. The in-form Turkey striker had also scored both his side's goals against Getafe on Sunday and his tally of 18 goals is his highest in Spanish football since arriving at Real Sociedad in 2001. Recre tried in vain to get back into the game, but Villarreal looked in control after Nihat's strike and chances were at a premium as the second half wore on. The home side were cheered on by their vociferous home support, but lacked their early intensity and appeared short of ideas as the full-time whistle approached. And those fans were left disappointed as substitute Guille Franco latched onto Santi Cazorla's pass and fired home a clinical second after 82 minutes. Recre threw men forward, but there was no way back for the home side. However, it was not all bad news for Recre as Real Mallorca's 2-1 win against Osasuna meant the Andalusians remain clear of the relegation zone with two games remaining. KAYSERISPOR took home the Fortis Turkey Cup and gained a berth in the UEFA Cup after beating Ankara's Genclerbirligi on Wendsday night in European football's second longest penalty shootout. A total of 28 shots were taken after a goalless 120 minutes dominated by Genclerbirligi before Kayserispor won 11-10. Genclerbirligi were also involved in the longest European penalty shootout on record, in another Turkey Cup match in November 1996, when they won a shootout against Galatasaray 17-16 after a 1-1 draw after extra time. Turkishsoccer.com Editor and this blog's Editor Ahmet Turgut, will be on talkSport Radio in England live Tonight at 9:00 PM, England time and 3:00,ET. TalkSport Radio is number one sports talk radio in England. Ahmet Turgut will discuss Turkish Turkcelll Super league in the program. Turkey are on course to reach the semi-finals after making it two wins from two Group A games with a 1-0 defeat of a still point-less Scotland. The UEFA European Under-17 Championship hosts secured the victory through Emrah Yollu's 13th-minute goal which put the seal on a first-half performance. Scotland came into the contest more after half-time but were unable to find an equaliser. Senol Ustaömer's team, 3-0 conquerors of the Netherlands on Sunday, took an early lead when Emrah headed Özgür Çek's left-sided free-kick into the top corner of Grant Adam's goal. Batuhan Karadeniz might have doubled the advantage as he latched on to a fine long pass from Emrah soon after. There were further first-half chances for Sefer Sever and Scotland's Archie Campbell, but with Gökhan Töre, Soner Aydoğdu and Sefer holding sway in midfield, the local favourites enjoyed a period of comfort. John Fleck and Turkey's Erhan Karayer and Abdülkadir Kayalı were booked after the restart, as Scotland finally opened up. Ross Mathie's team, who had brought in Alex Cooper and James Keatings after their opening-day loss to Serbia, threatened to draw level after 56 minutes. A fine passing move resulted in substitute Michael Deland crossing from the left and Archie Campbell scooping a shot towards goal which Turkey No1 Metin Uçar stretched to tip wide. Scotland keeper Adam also earned plaudits with a fine stop from Batuhan, as Turkey held on to the three points. 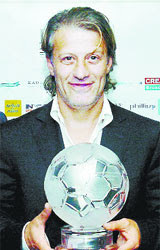 Tugay received recognition for his ‘outstanding contribution to the club’ at Rovers’ end-of-season awards. The 37-year-old pass master, one of Rovers’ best ever players, has spent seven seasons at the club since joining them from Rangers in 2001. Saturday’s feted appearance as a substitute against Derby could be his last at Ewood Park, with the Turk’s contract due to expire in the summer and Mark Hughes yet to offer the player an extension. Tugay has started less than a third of Rovers’ Premier League fixtures this term and Hughes is wary of the former Galatasaray star's advancing years and the effect it will have on his fitness. it remains to be seen whether the 37-year-old will still be at Ewood Park next season, with manager Mark Hughes delaying a decision. # Peter Jackson the Jeweller Seasonal Man of the Match Award - David Bentley. # Special Club Award - David Dunn; Unsung Hero - Stephen Warnock. # Newcomer of the Year - Roque Santa Cruz. # Goal of the Season - Tugay (for his goal v Reading). # Performance of the Season - Brad Friedel (v Man Utd). # Outstanding Contribution to the Club Award - Tugay. # Young Player of the Year - Martin Olsson. # Players' Player of the Year - David Bentley. # Player of the Year - Roque Santa Cruz. No wonder why TFF( Turkish Football Federation) change the place from Izmir to Bursa!.. Bursaspor fans maybe the only city that filled the stadium in every match in the Turkish Super League this season. What is so interesting is Genclerbirligi was in Danger zone until this weekend.. 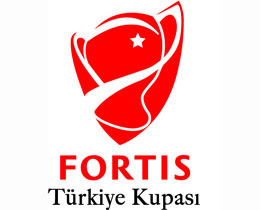 If Kayserispor win the Turkey Fortis Cup, this will be second Fortis Turkey Cup for the city of Kayseri. 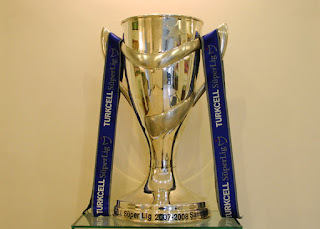 Last year, The team relegated, Kayseri Erciyesspor, won the Turkish Fortis Cup. on the other hand, Antalyaspor, after dropping last season , they will reenter the league again after only spending one season in the Bank Asya Turkey first Division. Kocaelispor beat visiting Giresunspor 2-0 on Sunday to remain on top of the Bank Asya Lig 1 (second division) 18-team standings. With only one game to go, Kocaelispor has 61 points, followed by Antalyaspor (60 points) which beat Gaziantep Büyüksehir Belediyesispor 2-1 away. Sakaryaspor, a 3-0 away winner at Samsun on Sunday, is third with 58 points. The top two teams from League1, will gain automatic promotion to the Turkcell Super League, while the third to sixth teams will lock horns in a playoff for the only Super League berth. Other League 1 results on Sunday were as follows: Elazıgspor 2, Mardinspor 1; Kayseri Erciyesspor 1, Altay 2; Boluspor 2, Malatyaspor 0; Karsıyaka 3, Eskisehirspor 3, İstanbulspor 1, Diyarbakırspor 2; and Orduspor 2, Kartalspor 5. Galatasaray beat title hopeful and "my team of the year" Sivasspor in an away match 5-3 on Sunday and assured the Turkey Turkcell Super League soccer title. Galatasaray reached 76 points after this win while Sivas remained at 70 points. Fenerbahce also won a tough match at home 3-2 game against Genclerbirligi and remained in second place with 73 points. If Galatasaray beats Genclerbirligi Oftasspor at home next week,They will claim the title. Even a draw gives the title to Galatasaray. Galatasaray has to lose and Fenerbahce has to beat Trabzonspor in a away game. Besiktas also beat Ankaragucu 2-0 in Ankara to move to 70 points and share third place with Sivas. The third team to be relegated from the league was Vestel Manisapsor which lost to Kasimpasaspor at home. Both Kasimpasa and Rizespor were already relegated last week. The Turkcell Super League tittle chase will be on the line this Sunday in Sivas. My "team of the year", Sivaspor will host League Leader. A draw or a win will make Galatasaray the Champions of Turkey this season. Sivasspor, is in third place with 70 points. Fenerbahce who is on second place also has 70 points. Defending champions Fenerbahce will be at home against Genclerbirligi. Fenerbahce must beat Genclerbirligi to maintain the second place and carey the race to the last weekend. This will be the most exciting weekend as Galatasaray is close to the title with 73 points beating Fenerbahce Last Sunday. 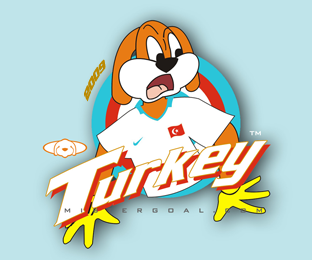 On the other hand, Manisaspor is looking for miracles to stay in the Turkcell Super League. Because, First,they have to win this weekend and beat Besiktas in Istanbul in the last week. And than,wait for Genclerbirlgi and Konyaspor to lose their both matches..
Week 33rd matches, will take a start on Saturday , The most important matches in the league will be played on Sunday.All the matches will start at the same time. The starting time is 19:00 Local Turkey time and 12:00 Noon ,ET in the North America. Turkey's preparation camp for EURO 2008 finals will begin in Antalya immediately after the end of final matches of Turkish Turkcell Super League. Turkey squad will gather at Gloria Golf Resort which is in Belek region of the city. Turkey squad will stay there until 15 May and after a one-day temporary accomodation in Istanbul, they will fly to Germany on 17 May at 11.00 with local time. Turkey will use Münster Airport and then pass to Marienfeld where they will stay at Hotel Klosterpforte. Turkey will travel to Geneva, Switzerland on 1 June with a flight at 11.30 and accomodate at La Reserve Hotel there.